There are typical seasonal variations in familiarity. The above graphic shows this. Betty’s Taylor has the greatest familiarity and declined the least proportionately. Other polling shows the familiarity of Pat Farr, Kitty Piercy, and Peter Sorenson, all well known among Eugeneans, all changed little as well. One would think that the variation would be proportional to the level of familiarity. Clearly there is a drop for nearly everyone. 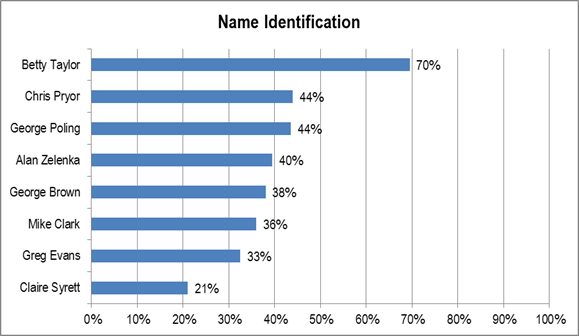 However, the variation among those councilors with less Name ID tends to be greater than those with greater Name ID. The reason for the greater variation goes back to the inverse link between information and volatility. The lower the level of information or familiarity the more volatile the level of information or familiarity should be. Of course, these are all general rules and general principles. Some, like Greg Evans, clearly are continuing to gain in relative position. 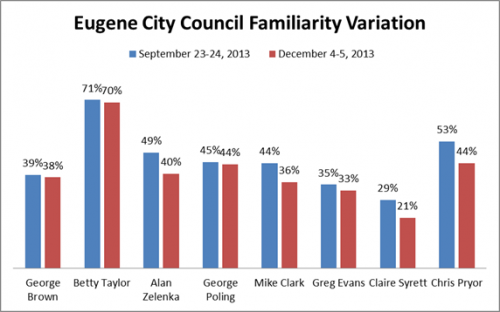 METHODOLOGY 200 live telephone interviews of a random sample of likely 2014 City of Eugene General Election voters were conducted each of September 23-24 and December 4-5, 2013. The margin of error at the sample median for each is 7 percent. Betty Taylor, now that Pat Farr has moved up to County Commissioner, is clearly the best known city councilor. METHODOLOGY 200 live telephone interviews of a random sample of likely 2014 City of Eugene General Election voters were conducted December 4-5, 2013. The margin of error at the sample median is 7 percent. 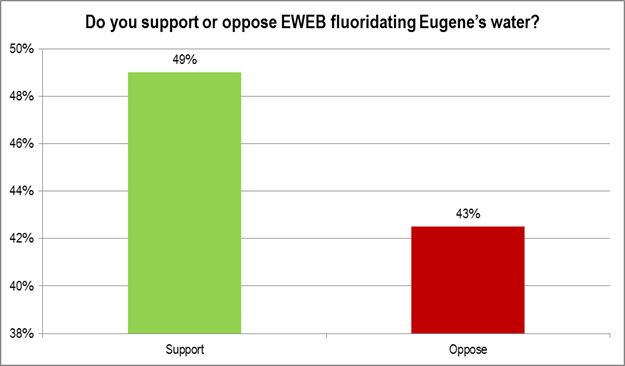 It appears that, unlike Portland, Eugeneans continue to support fluoridation. QUESTION Do you support or oppose EWEB fluoridating Eugene’s water? IF SUPPORT OR OPPOSE: Is that strongly or somewhat? IF DON’T KNOW: Which way do you lean? More on what to do about getting more office space for the City of Eugene. 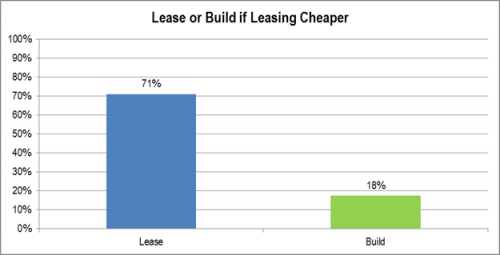 Real estate experts indicate that, in today’s market, leasing office space is cheaper than building office space downtown. When this information is added the percentage preferring to lease increasing dramatically. cheaper would you still support building? December 4-5, 2013. The margin of error at the sample median is 7 percent. 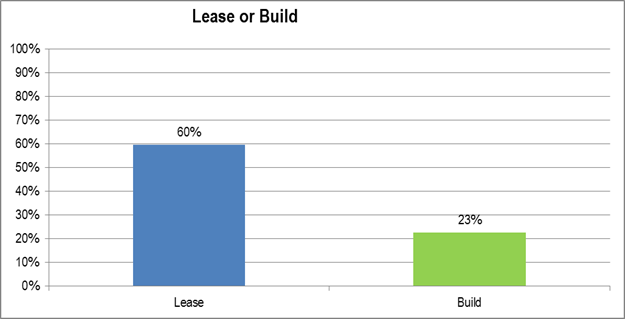 There is a clear preference for leasing instead of building new space for city offices. This clearly fits with the general preference for cutting expenditures instead of increasing revenues. QUESTION Should the City of Eugene build a new city hall or lease space downtown [ROTATE]? The net favorability for SLEEPS has increased, though it is still far underwater. 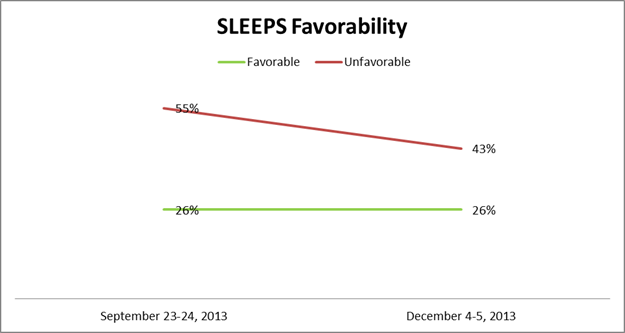 However, favorable are still low. The real switch has been from unfavorable to “Don’t Knows” or “No Opinions,” which would imply people are forgetting about SLEEPS. QUESTION Please tell me whether you have a favorable or unfavorable opinion of the SLEEPS Homeless Protest Group? IF FAVORABLE OR UNFAVORABLE: Is that strongly or somewhat? METHODOLOGY 200 live telephone interviews of a random sample of likely 2014 City of Eugene General Election voters were conducted each of September 23-24 and December 4-5, 2013. The margin of error at the sample median is 7 percent. Instead of a restaurant tax, some have proposed to exempt fast food restaurants in order to make the tax more progressive. The opposition increases significantly. 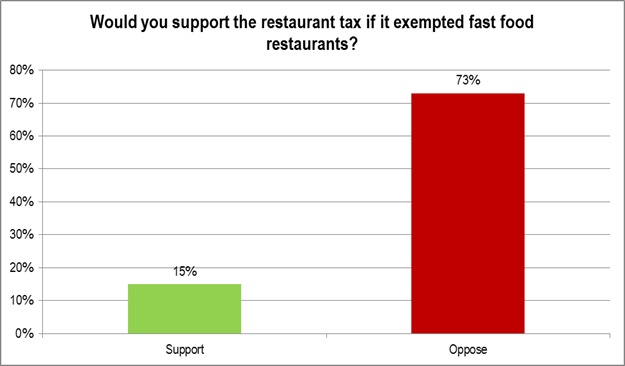 QUESTION Would you support the restaurant tax if it exempted fast food restaurants? IF SUPPORT OR OPPOSE: Is that strongly or somewhat? IF DON’T KNOW: Which way do you lean? Some have suggested Eugene institute a restaurant tax in order to make up the revenue shortfall. Clearly, there isn’t much support for that option. The 1993 restaurant tax proposal was the key public result from the Eugene Decisions process. It lost in an overwhelming landslide. 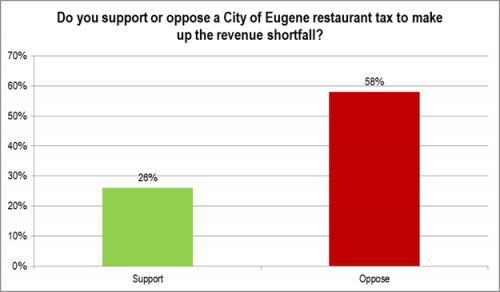 QUESTION Do you support or oppose a City of Eugene restaurant tax to make up the revenue shortfall? IF SUPPORT OR OPPOSE: Is that strongly or somewhat? IF DON’T KNOW: Which way do you lean? 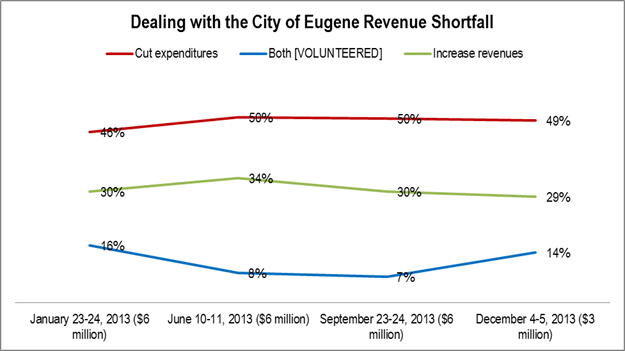 QUESTION As you may know, the City of Eugene has a $3 [EARLIER $6] million dollar shortfall. 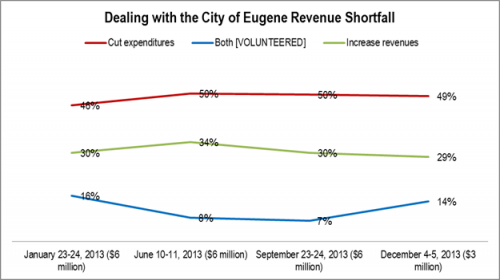 Should Eugene increase revenues or cut expenditures? Jay Bozievich’s favorable have dropped a bit countywide. This is probably due to the controversies he has been involved in during the past year. Now, I am going to read the names of some people. Please tell me whether you have heard of each. IF HEARD OF … Do you have a favorable or unfavorable opinion of Jay Bozievich? 200 live telephone interviews of a random sample of Lane County likely 2012 General Election voters were conducted February 29 through March 2, 2012. The margin of error at the sample median is 7 percent. 200 live telephone interviews of a random sample of Lane County likely 2014 General Election voters were conducted October 28-29, 2013. The margin of error at the sample median is 7 percent.